Published Oct 18, 2013 by Addison-Wesley Professional. Part of the LiveLessons series. Based on the best-selling book,Java Performance, Java Performance LiveLessons covers the latest Oracle and third-party tools for monitoring and measuring performance on a wide variety of hardware architectures and operating systems. Renowned expert, Charlie Hunt, provides viewers with an overview of a modern Java Virtual Machine, the critical performance statistics to monitor within an operating system, JVM, and Java application, an overview of how the HotSpot garbage collectors work, an explanation of the garbage collection output produced by the garbage collectors, and a step-by-step approach to tuning a Java application. 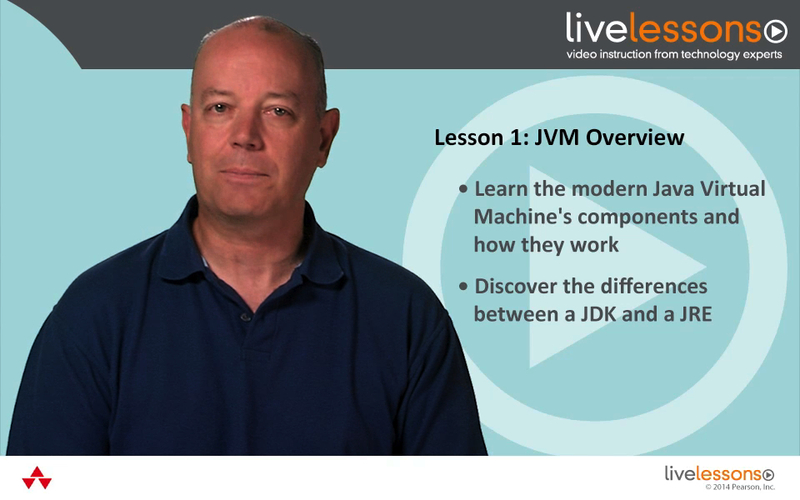 Lesson 1, “JVM Overview,” covers the differences between a JRE, the Java Runtime Environment, and the JDK (the Java Development Kit). It’s important to understand the differences since one of the differences is the inclusion of monitoring tools in the JDK but not the JRE. The lesson also includes a description of the major components of the HotSpot Java Virtual Machine as well as their roles and responsibilities. Lesson 2, “Collecting Performance Statistics,” begins to establish a methodology for assessing performance issues. Isolating the root cause of a performance issue requires a methodology that uses the collection of performance statistics and the resulting data to drive the next steps in the root cause analysis and ultimately provide a resolution. The approach extends to each level of the software stack: operating system, JVM and Java application. The lesson concludes with a discussion of the application level performance statistics you should monitor and suggests ones to incorporate if they are not included in the application already. Lesson 3, “Understand HotSpot JVM GC Logs,” starts with the assumption that tuning a JVM most oftentimes requires the tuning of the JVM’s garbage collector. This lesson illustrates how the HotSpot JVM’s Parallel GC, CMS GC and G1 GC work. Understanding how they work greatly increases your ability to tune them effectively. The lesson also includes a description of the meaning of each field produced in the GC logs for each garbage collector. Once you’ve completed this lesson you will be able to explain how each of the garbage collectors work and describe the meaning of the output produced in the GC logs for a given garbage collector along with being able to make informed decisions when it comes to tuning the JVM’s garbage collector. Lesson 4, “Tune the HotSpot JVM Step-by-Step,” presents a step-by-step approach to tuning the HotSpot JVM. This lesson walks you through the steps of creating a plan of attack by documenting the footprint, throughput and latency requirements that the Java application needs to have met. Then the lesson shifts to showing a flowchart that illustrates the step-by-step tuning process. The remainder of the lesson takes you through the step-by-step process by evaluating the expected memory footprint required to run your Java application. Then it turns to evaluating latency performance of your Java application and potentially tuning the JVM to meet the latency requirements. Similarly it covers throughput requirements and potentially tuning the JVM for throughput. This lesson concludes by showing some additional JVM command line options that may help improve your application’s performance that are not necessarily specific to tuning the JVM’s garbage collector.